The eight-measure theme is in 3/4 time, strong in meter, in spine, in sound — chords and melody walk chromatically away from C minor, reach a climactic sforzando on IV (F minor), then quickly run home again. Scale notes of the statement transform to arpeggios and repeated notes in 16ths — “lightly, lightly,” Beethoven tells us — who are we to question? Harmonic form identical, sf on F intact, but resolve has given way to raindrops, sweetness prevails. Still leggiermente, the bass steals the treble’s pattern verbatim. It is Variation I turned exactly on its head. Beethoven, not ready to relinquish a good idea, combines I with II — arpeggios abound in both hands at once! The strength of it is its beauty — form intact, meter intact, C minor reigning. A departure — simple outer voices trace the theme as an inner voice dances in triplets; staccato adds delicacy. This variation truly floats. Orchestration comes to mind, of winds and strings — the piano must work some magic. Cm (for those who must label and analyze) — are presented simply at first, but slurred octaves in the melody take over, crescendo, overlap one another in a stretto effect right before resolving to C minor. Each variation builds in tension to the sforzando at F minor, then tumbles to C minor — release of tension. So Beethoven uses sound to create a physical and emotional event. The markings ff and sf on every initial impulse tell the story. We sense a martial atmosphere of bombast and rhythmic discipline. The graceful triplets of Variation IV no longer dance — they march, mark time and protest. In utter contrast to the one before, Variation VII is calm, a melody of descending scale notes under legato slurs — could be the long bow of a violin against a rumbling base of cellos — smooth, velvet, never harsh, never hurried. seems to emerge organically from VII — bass so similar, treble climbing and falling in thirds (a merging of both voices) but with the theme still transparent. One aspect of the original theme is its powerful first beat leading to an inevitable reaction by the treble. This is honored throughout the work. Beethoven has kept within a strict eight-measure form, the same basic progression of chords always in 3/4 time. So much from so little — poetry. Scales, arpeggios, staccato, legato — how can such simplicity move us so? I am reminded that he composed the second movement of his Seventh Symphony from a single note — a scale is a mountain of motive in that context. Groups of six notes in the middle voice, duples at the bottom, on top only two slurred notes, a simple sigh, over and over gaining in passion and reinforcing the now-familiar theme. A strong running bass in 32nd notes (Hanon could have written them but here they seem to rail in unrest), sempre forte our cue, this is not a gentle variation but another rattling cage. Again he plays with inversion — is it a game, a child’s puzzle? The bass of Variation X becomes melody, a pure upside-down cake — still forte, still relentless, still fiery. Three flats of C minor are wiped from the score — piano semplice are the blueprints of expression given us by the composer: “Do as I say!” Eight measures of respite ensue, a lovely retelling of the theme now in C major, without angst, as in a monk’s garden. Two treble clefs bring the bass closer to the treble and continue a naïve character, the treble spinning slowly in 16ths, the left hand outlining the theme. Again, the absence of minor opens a path to a more pastoral interpretation. Staccato thirds enrich the plainer writing of Variation XIII. The addition of thirds and the vitality of staccato create a wholly different character, a little like taking the same five letters and forming two different words. The simplicity of the forerunner morphs into a playful, teasing sibling of itself. One senses Beethoven’s delight in limitless variety, in the music, in himself. 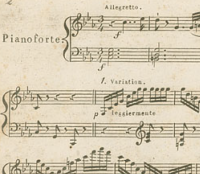 Continuing in C major and with the directions dolce, crescendo and risoluto, Beethoven writes a melody and bass in triplets, three sets to a measure, seeming to expand the theme, draw it out and alter it again. He creates a new and sublime character, a thing so different from the original statement but still wrought from its bones. The final variation in C major — 16ths against triplets, the first note of the bass leading to the melody. One hand cues the other as in the opening statement. Even in the hectic motion created by octaves in 16ths, the notes of the theme can be heard. Reinforcing the theme becomes obsolete at this point; other aspects of the variation can be brought forward without fear of losing the listener’s thread to the theme. It is here that I will pause before Beethoven resumes in C minor.